Keith Jarrett‘s so-called American quartet, meaning the ensemble of bassist Charlie Haden, drummer Paul Motian, and saxophonist Dewey Redman led by the esteemed pianist during the early-mid ’70s, has never lacked for accolades, but of late their work has been intently heralded by musicians and critics alike. Rightfully so: the foursome’s vitality was unique, boasting lyricism, agility and a particularly earthy quality marked by Redman’s natural gruffness. In comparison, the pianist’s European quartet of saxophonist Jan Garbarek, bassist Palle Danielsson, and drummer Jon Christensen felt a bit more prim. Overlapping in activity by several years, the bands had similar designs but different approaches. Everything seemed comparatively reserved on luminous titles such as Euro 4’s Belonging and My Song. Sleeper, a live double disc fresh from the ECM vaults, eradicates that “prim” designation, and proves the band was closer to their rambunctious American cousins than conventional wisdom has had us believe. Recorded during the same live 1979 date as the previously issued Personal Mountains, this new album is a cleverly contoured ride that suggests the rhythm sections of both outfits were of equal clout, supplying their colleagues with non-stop ardor that nudged Jarrett and Garbarek to unexpected levels of frenzy. Maybe frenzy is too strong a term, but even in its quiet moments Sleeper is rife with exuberance. Christensen’s kinetic pummel, the leader’s percussive trills, Garbarek’s fierce attack – the album’s signature trait is momentum, and the vivid audio mix makes the action that much more animated. One of those dates where you agree with Jarrett’s occasional “Ohhhhhhh” interjections because you can definitely hear the ardor he’s celebrating. Putting interplay front and center while delivering a parade of delectable melodies, Sleeper is a marvel of commotion. And given the title of the sideways funk opus that is “Chant Of The Soil,” yes, it might be just as earthy as some of the discs made by Jarrett’s U.S. team. It was gnarled momentum that initially made me fall for Tim Berne’s music. Some of the cresting swells of early albums like 7X and Mutant Variations helped sell a compositional style that fully values kinetic crescendos. Because he’s a texture fiend, the saxophonist has historically left plenty of room for visceral sounds that up the ante as well. From Fractured Fairy Tales to Bloodcount, his bands have been expert at throwing punches while galloping by. So I’m wondering why I’m so smitten with the utter grace of Berne’s latest outfit, Los Totopos. He hasn’t made any stylistic switch-ups for his first ECM disc, but the level of refinement that this new music boasts is unmistakable. Surrounded by Oscar Noriega’s clarinets, Ches Smith’s drums, and Matt Mitchell’s piano, the leader’s alto patterns have moved from tumbling to swooping. That momentum mentioned above is still there – parts of Snakeoil, like the drive towards oblivion at the end of “Scanners,” come on like a locomotive – but the group’s unity bevels the turbulence. I got to see the band during several formative gigs, and they were tight. But this disc captures an eloquence that wasn’t there prior. One of the program’s strong points is the ensemble’s ability to be diffuse yet determined. From the opening speculation by Mitchell (whose ability to render frenzied passages with a gentle touch is crucial to this refinement thing I’m talking about) to the dreamy investigations the band renders on “Not Sure,” Los Totopos concoct the kind of formal informality that the Art Ensemble claimed as their own early on. The start of “Spare Parts” offers jitters inside a feathery reflection. The tune’s mid-section finds everything on constant simmer, waxing supple and prickly at the same time. Noriega’s pulpy tone is a rich foil for Berne’s signature tartness. Smith’s deep palette of pummel options dodges cliché at every turn. Mitchell, who studied the bandleader’s music as a student, deploys the kind of whimsy that’s imbued with gravitas. Along with Manfred Eicher’s meticulous production, these singular skills help Berne reshape his sound. Together, they’ve found a way of presenting architectural idiosyncrasies as enchanting wrinkles. There are many measured moments on Steve Kuhn’s new trio disc. The 74-year-old pianist isn’t known for flaunting expressionism or dedicating himself to experimentation – unless expressionistic moves are deeply lyrical and inventing phrase after phrase after phrase is an experimental tack. I’ll stop the facetiousness; we know both notions to be true, and Kuhn, who brings a modern bop lingo with him everywhere he goes, has skills in both approaches. 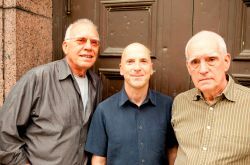 This date with electric bassist Steve Swallow and drummer Joey Baron is memorable because each musician has a singular sound, so the group’s collective demeanor is singular as well. While they don’t always mesh, they don’t always mesh in truly fascinating ways, ways draw you into the music. How cool is that? When they do fully connect, which is often, it’s in a variety of dynamics. “A Likely Story” (the track that would kick off side two if Wisteria were a vinyl album) is smoker, a piece that refutes that “measured” comment above. The crackling hard bop that Kuhn brought to Coltrane’s post-Giant Steps working band is front and center here. With Baron conjuring Tony Williams and Swallow proving how waxing nimble can mean waxing provocative, the ensemble invests in exclamation. But Wisteria is ultimately about variety, and the glide that arrives on “Pastorale” as well as the reflection that defines the title cut (a gorgeous tune written by another of the pianist’s employers from over a half-century ago, Art Farmer) remind that Kuhn is an expert at scripting a program. Sometimes plush, sometimes spartan, this is an album that shifts just often enough to keep you turning your head. Some bandleaders are so tied to a particular sound that during the arc of their career it seems a formula has been put in place. Norwegian pianist Tord Gustavsen fashioned a seductive style of balladry when his first ECM disc arrived in 2003. Changing Places introduced us to an instrumentalist who made silence a constant companion, and who seemed as smitten with the establishment of mood as he was with the generation of interplay. Most of the records that arrived in its wake forwarded a similar message. The Well brings more of same to the table, but rather than chiding the bandleader for a monolithic view, let’s applaud his focus and dedication to poised reflection. The more I spin this album, the more I fall for its through-composed persona. That description of the music isn’t literally true; Gustavsen’s team of tenor saxophonist Tore Brunborg, bassist Mats Eilertsen, and drummer Jarle Vespestad invent personalized lines on every track. But the ensemble demeanor is so tight and so smitten with the pianist’s melodies, there’s little “soloing” taking place in the old fashioned sense. The group sometimes has a problem with originality. Gustavsen operates in the wake of Keith Jarrett. The touch, the tunes, the gentle sweep of the reflective aura that gives the music its main personality – they’re all beholding to the iconic pianist on some level. While sounding tender and alluring, Brunborg, too, seems a composite of Jan Garbarek and Charles Lloyd. It’s a sweet combo of influences to say the least, but it makes him hard to pick him out in a crowd. That said, The Well has enough eloquence to control its emotional environment in a deeply authoritive way, an achievement in any kind of music. If you’re into glistening melancholy, this one has a poetic side. The old tightrope-walker cliché that gets used in jazz reviews actually takes on an irrefutable resonance when applied to the way Keith Jarrett has approached his solo shows through the last four decades. There is something truly daring about sitting at the piano and holding forth for 120 minutes of unscripted improvisation. It’s a big old crap shoot: will the resultant music be engaging enough to thoroughly entertain an audience. From Bremen/Lausanne to Testament Jarrett’s managed to blend rumination with ebullience with enough dynamic thrust to earn himself an audience that hangs on his every note. Rio keeps that status intact. Indeed, it’s one of Jarrett’s most fetching solo discs. The pianist has long moved back and forth between non-stop, rapturous excursions to short pieces that stand by themselves, and the Spring, 2011 Brazilian concert that generated this music was geared toward the latter. I’m a fan of the free-flowing approach, but the focus that’s found in each of the discrete tracks here is seductive. “Part XII” is lilting yet resolved – one of his prettiest gossamer moments. “Part X” is antsy yet determined – a modern smooch to Art Tatum. The piece that begins the performance is perhaps the most enchanting. Using tempo and tone, he turns a chattering stream of phrases into an essay on dissonance’s alluring side. The left hand bounces bass patterns, the right hand responds with animated trills. The piece is bother skittish and secure. The fact that it’s a spontaneous workout only adds to its rich mystique. Jarrett, like few others, has a way of making the extraordinary seem commonplace. Sometimes the measured approach is the exciting approach. When jazz elders Lee Konitz, Charlie Haden and Paul Motian connected with 40-year-old pianist Brad Mehldau for several sets of clever improv at Manhattan’s Birdland in the winter of 2009, there was no exclamation coming from the bandstand. Their ardor was closer in temperament to the kind you’d find in a chess game. Like the Modern Jazz Quartet, their actions were refined, but their art was gripping. At least that’s how it sounds on this new disc, which finds the quartet steadily mulling over their options before making deliberate moves that weave in and out of each other’s spheres. A spray of cymbal taps by Motian triggers a rumble from the bottom of Mehldau’s piano. The pulsed thumping of Haden’s bass spurs a flurry of sideways notes from Konitz’s horn. The thematic material of chestnuts like “Solar” and “Oleo” becomes secondary to the extrapolations the unit steers collectively. On “Lullaby of Birdland,” the melody barely gets a mention. Its DNA is harvested by these masters for alternate purposes. Indeed there a few moments here prompting a head-scratch or two: “I thought I knew what tune this is, but now I’m not so sure.” For the most part, that’s a good thing. The music is perpetually morphing, and its creators are calmly in control of its destination.